Members of the St. John Vianney High School baseball team celebrated after defeating Columbia Hickman High School to win the MSHSAA Class 5 baseball state championship on June 1 at Car Shield Field in O’Fallon. Vianney won the title after losing in the semifinals last season. Expectations were high for St. John Vianney’s baseball team this year after it came within a whisker of going to the state final last year. This year’s team reached the title game June 1 at Car Shield Field in O’Fallon. Noah Niznik’s four-plus innings in relief and an offense determined to bounce back from an early deficit led to an 8-2 win over Hickman and a Class 5 championship. Hickman jumped out to a 2-0 lead in the first inning off starter Mitchell O’Dekirk who, like Niznik, had an outstanding season. Vianney responded with three runs in the bottom of the first, highlighted by a two-run single by Dominic Moro. 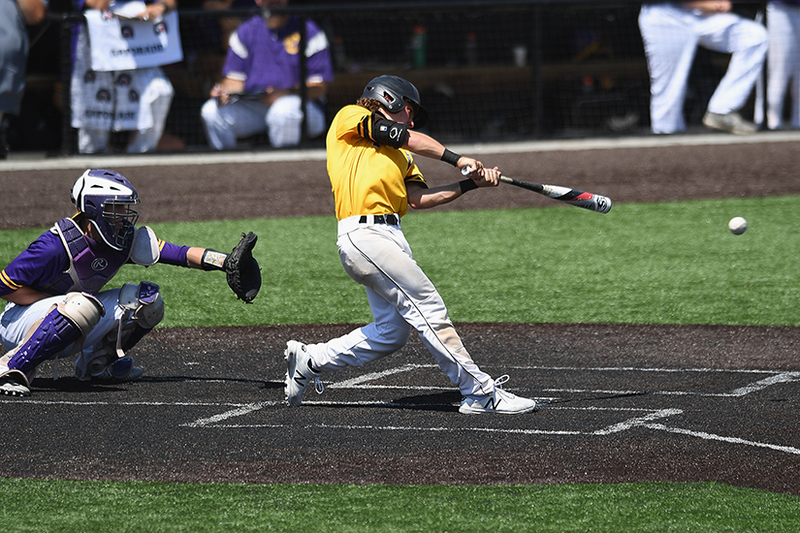 Vianney’s Luke Mann, playing first base after pitching six innings and hitting a three-run home run in a 5-3 semifinal victory against Blue Springs South, said his team felt confident of a comeback. “It was really nothing we hadn’t done before, so we were prepared and didn’t get edgy,” he said. The 37-2 Griffins “definitely knew we had a target on our backs” after last season, Mann said, and learned to embrace it. The players trusted the process of getting better each day of the season, he said. Their faith plays a role in a family aspect to the team, he said, including going to Mass before games such as the Final Four, praying before games and coming together when facing adversity. After Vianney scored a run in the second with a home-run over the right field scoreboard by Brock Daniels, O’Dekirk got in trouble with a couple walks. Vianney coach Scott Brown wasted no time in bringing Niznik in to shut down the threat. Brown said in a regular-season game he’d probably have left the starter in to pitch, but in a playoff game “there is no tomorrow.” The coach praised both of his pitchers for their efforts, with Niznik having his best velocity, a sharp breaking ball and an effective change-up. A double by catcher Andrew Keck and single by Charles Cepicky keyed a four-run fourth inning for Vianney. Dominic Moro hit in the third inning against Hickman. Moro had a two-run hit in the first inning. Vianney played the maximum number of games allowed and against tough teams in the regular season to be prepared for the postseason, Brown said. A game against Parkway South, coming back to win 13-8 after being down 8-1, provided confidence and an example of team leaders taking control. Moro jumped in that day to inspire his teammates, who simplified their approach and took the lead. In other games, Mann and Keck provided the same leadership. Last season, Vianney lost 4-3 to Ft. Zumwalt West in the state semifinal. The team finished 32-7 after a 9-0 win in the third-place game highlighted by a standout performance by Niznik on the mound. Aurora’s Austin Erickson shut down St. Mary’s offense in the Class 4 final, though the Dragons had a chance to win in the ninth thanks to an almost equally dominant pitching performance by Bryce Grossius. Down 2-0 in the last inning, St. Mary’s loaded the bases with two outs after an error and two batters being hit by a pitch. But Erickson regained control and kept his no-hitter. 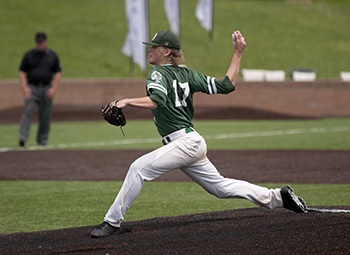 St. Mary’s High School pitcher Bryce Grossius delivered a pitch against Aurora High School during the MSHSAA Class 4 state championship game June 2 at Car Shield Field. Aurora topped St. Mary’s 2-0 to win the title. The day before the semifinal game, he said, he saw a pop-up Bible quote on social media that was a reminder to stay calm. He wears a cross and keeps a religious item in his back pocket as expressions of his faith. Valle Catholic played in the Class 2 state baseball finals May 29 at Car Shield Field in O’Fallon, taking its fifth state championship with a 12-5 win over defending champ Mansfield. Christian Loida drove in three runs and Kellen Blum and Tyler Blum each drove in two for Valle. Carter Roth, batting leadoff, scored three runs on three hits and a walk. Coach Nathan Gegg’s team had 16 hits. Seven of the hits came in the fifth inning with two outs. Nolan Schwent pitched three 1/3 innings of relief and struck out three for the win. Tyler Blum finished the game with two hitless innings. The Warriors, 25-9, earned a trip to the finals with a 6-1 win over Skyline May 28. Loida pitched a complete game, giving up just three hits. The team won championships in 2008, 2014, 2015 and 2016.